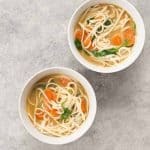 Vegan Chicken-Less Soup! This healthy vegan chicken-less soup is so nourishing and delicious. Ginger, garlic, carrots, spinach and ramen noodles in a simple miso broth. In a medium soup pan, heat the toasted sesame oil over medium heat. Add the scallions, ginger and garlic, carrots and cook for a few minutes stirring often, taking care not to brown the garlic. Add the broth, then bring to a low simmer and cook for about 8-10 minutes to help flavor the broth even more and gently soften the carrots. Remove one cup of broth, and place it in a separate bowl. Add the miso to the reserved 1 cup of broth and stir until completely dissolved. Set aside. Add the noodles to the broth and cook until noodles are just al-dente. Add in the spinach and stir until spinach is wilted, another minute. Remove the soup from the heat and add the miso broth back in. Stir to mix and serve!